EHS Day has been described as a fun but extremely competitive day where teams from 16 sites throughout the UK and Ireland compete in three categories of competitions – First Aid, Risk assessment and Fire & Emergency response. The Fire & Emergency response drills, in particular, were very impressive. We, as the audience, got to see competitors from each fire team dealing with various different fire emergencies. The Cork team came in 1st place in 7 of the 10 categories of Fire & Emergency response. The event has taken place since 1965 but this is the first time the EHS Day has taken place in Ireland. 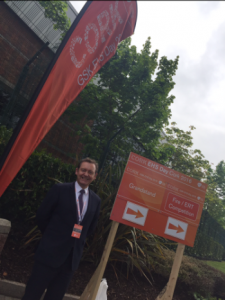 GSK Cork has received high praise and congratulations from all!